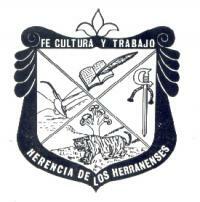 Herrán is a municipality in Norte de Santander Department. It was founded on 6 November 1860. The flag of Herrán is horizontally divided white-green white. "Designed after Jaimes Vega's idea, the flag is made of three stripes of equal dimensions, from top to bottom, white, green and white. White symbolizes values such as honesty and the pacific spirit of the Herrán villagers while green represents ardor to work and constancy."